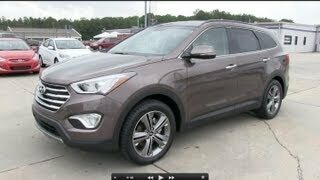 The Hyundai Santa Fe 2013 has been unveiled at this year's New York Auto show and interestingly enough the third generation seems to have been heavily, or rather completely redesigned inside and out. New powertrains have been introduced, improvements have been made in the comfort department and more safety features have been added to Hyundai's latest CUV. 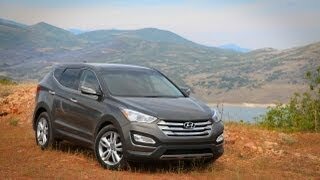 The new model also comes in two different variants, the basic model that comes with three rows of seats for seven passengers, and the Santa Fe Sport with two-rows and five-seats. The Sport is a bit shorter than its counterpart but it's also lighter and gives a better driving feeling. Under its hood resides the 2.4 liter Theta II four-cylinder direct-injected unit that's also found in the Hyundai Sonata sedan. The unit delivers 190 horsepower and 181 lb-ft of torque. Manual and automatic transmission is available and with the automatic gearbox fuel economy is estimated at 33 mpg. There's also a smaller yet more powerful engine for those interested, a 2.0 liter GDI turbo engine that will deliver 264 horsepower and 269 lb-ft of torque. Fuel efficiency for the front-wheel drive version equipped with the automatic gearbox is rated at 31 mpg highway and 22 mpg city. 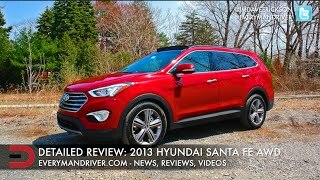 In terms of aesthetics the new Santa Fe differentiate from its predecessors a mile away, but design changes are not the only changes brought to this newer model. The 2013 model has been built on a new architecture that is said to increase distortion rigidity by 16%. New equipment and technologies include the Driver Selectable Steering Mode system that gives the driver the option of choosing between Comfort, Normal and Sport electronic power steering settings. Torque Vectoring Cornering Control is also included, tremendously increasing traction depending on the road condition and also helping the driver in corners. Other features include the Downhill Brake Control and Hillstart Assist Control, both systems being included as standard. On the interior the CUV has been fitted with 7 airbags, a Blue Link infotainment system, a 4.3 inch display and air conditioning as standard. Optional extras include an 8-inch screen , dual-zone climate control and eight-way power driver's seat. 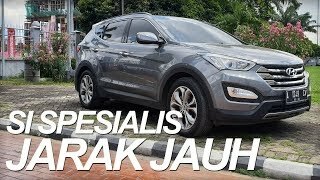 Pricing for the Hyundai Santa Fe Sport 2013 has been recently revealed and in case you're interested in buying one, it will set you back $24,450. Just remember that you won't be able to find the Sport in dealerships until the beginning of 2013. 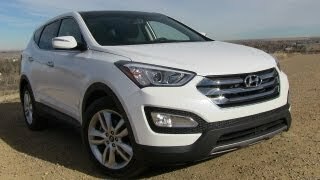 If however Hyundai'sCUV is not your cup of tea then you might find an alternative in the Toyota RAV 4 or the Chevrolet Equinox.